Genevieve Plaster, M.A. | March 14, 2016. According to the annual report from Oregon’s Public Health Division released in February, 132 people died from assisted suicide in the state – more people than in any of the 17 previous years and at a 26 percent increase from 2014. Most individuals who died by assisted suicide were 65 years or older, either had no insurance or government insurance, and were not currently married. 132 individuals died in 2015 from lethal assisted suicide prescriptions – more than in any previous year, up 26% from 2014 and almost doubled from 2013 (73 individuals). 125 individuals who died received the lethal prescription in 2015, while seven who ingested the lethal dose and died in 2015 received prescriptions in “previous years” (plural) – which continues to call into question the six-month terminal prognosis. 218 people were prescribed the lethal prescription – up 41% from 2014. Complications after ingestion of the lethal dose are unknown for 80% of those who died, as reports are only collected when the prescribing physician or another healthcare provider is present at the moment of death. At least one person died from assisted suicide 34 hours after ingesting the lethal dose. In previous years, someone died 104 hours after ingestion. 78% of those who died were aged 65 years or older. 63% of those who died either had no insurance or a government plan (such as Medicaid/Medicare/other) compared to a 40 percent average in previous years. 60% of those who died were either divorced (27.5%), widowed (26%), or never married (6.9%). Nine weeks was the median time of the medical relationship between the doctors who prescribed the lethal dose and the patients who died – 10 weeks shorter than in 2014. The three most frequently cited end-of-life concerns given by those who died were: “less able to engage in activities making life enjoyable” (96%); “losing autonomy” (92%); and “loss of dignity” (75%). Five patients were referred for psychiatric counseling (3.8%). 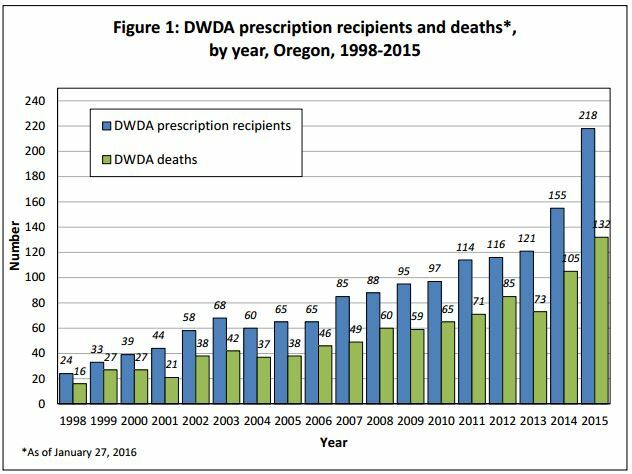 Despite the data from Oregon’s 18th year of physician-assisted suicide, advocates of its legalization continually point to the state’s experience as successful, largely counting the “unknowns” as indications of nothing gone awry. Yet real-life abuses and complications under the law have been and continue to be documented elsewhere. One major “unknown” has been the mental health of those who have died by assisted suicide. Only five of the 132 who died in Oregon in 2015 were referred for psychiatric evaluation. Overall, of the 859 people who died under the law from 1998 to 2014, only 5.5% were referred for an evaluation, according to the state’s annual report. Earlier this month, Maryland’s assisted suicide bill was withdrawn by its sponsor, Sen. Ronald Young, who cited a shortage of support and said he will likely not reintroduce it next year. Other states considering assisted suicide should heed the Oregon experience – as well as disability and elder rights groups, the American Medical Association, and others – and should oppose the legislation in favor of true healthcare for the suffering.